Why is it Important to get Your Name Included in the Electoral Rolls? For every constituency, there is a list of voters that is called the Electoral Roll. To be able to exercise your vote, your name must be in the Electoral Roll of the area of your residence. According to Article 326 of the Constitution and Sec. 19 of the R. P. Act, 1950, the minimum age for the registration of a voter in India is 18 years, as on the first day of January of the year in which the Electoral Roll is prepared or revised. Anyone who is a citizen of India and is at least 18 years of age is eligible to vote. People who are not citizens of India are not eligible to vote. Non-resident Indian Citizens who are employed under the Govt. of India in a post outside India are eligible to be registered as voters as per the terms of Sec 20 (8) (d), read with Sec 20 (3) of the R. P. Act, 1950. You can get your name included in the voters list either during a door-to-door campaign by the authorised Govt. functionaries, conducted once in every 10 years, or during annual revision, the date of which is published by the Election Department. You need to apply in the prescribed form, which is available either online or with the ERO (Election Registration Officer)/Designated Officer, and present yourself on the date of hearing. If everything is found to be in order, your name will be included in the Electoral Roll of the constituency in which you reside. A person living in a particular constituency can only get enrolled in that constituency and in none other. Also, one's name cannot feature in the Electoral Roll of more than one constituency at any point of time. Step 1 : The municipality generally opens camps at various locations and informs the residents to bring valid documents on the stipulated dates and timings. Be sure to reach the spot on the given day and at the given time with the required valid documents. 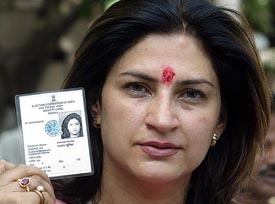 voters card in IndiaStep 2 : Take the Xerox copies along with you. You will need to show Xerox copies of the things mentioned in the Things you need section of this article. Step 3 : Take all interested family members along with you. All the members of a family who want to obtain a voters card need to present at the camp.